Early this morning I drove to Temple Beth-El to photograph my first Bar Mitzvah. On a very rainy afternoon last month I went to the temple to check it out in preparation for this morning's shooting. I liked the dome design of the temple. I thought it was interesting architecture. I was also pleased to see that lighting would not be a problem, as even on that rainy day, with the lights turned up, my single strobe style of photography would work well. On the tip is a hand shaped pointer, which I thought was pretty interesting. I searched for Bar Mitzvah photographs for reference, but did not find that many actually. I was able to find enough to know which certain types of shots are "must gets" for a Bar Mitzvah. The two above photos of reading from the torah (wide shot and close up of the hand) are Bar Mitzvah standards. Jake held this heavy scroll through many different Bar Mitzvah portraits with his family and the by himself. Jake was a very good sport during the one hour+ of shooting. He always had his smile ready and had no problem with multiple takes as various family members entered and exited the frame with him. Jake with his extended family in Temple Beth-El just before his Bar Mitzvah was to begin. Jake's Bar Mitzvah was both an interesting cultural and photography experience for me. Temple Beth-El was a great place to shoot in. In fact, I will profile the interior of the temple in an upcoming post. I look forward to photographing my next Bar Mitzvah. 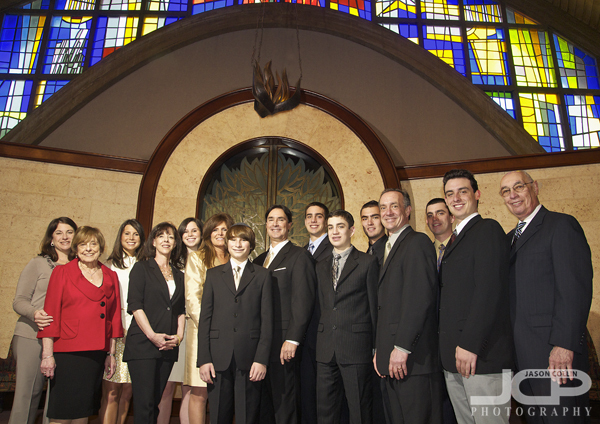 RESERVE YOUR BAR MITZVAH OR BAT MITZVAH PHOTOGRAPHY EXPERIENCE TODAY!